HEVC H.265 codec is so popular in recent years, because of its high compression ratio and image quality. Many users want to convert videos to HEVC H.265 format in order to get smaller-sized videos but in high quality. Given the same quality video, HEVC H.265 video can reduce file size of 52% for 480p video, 56% for 720p video, 56% for 720p video, 62% for 1080p video and 64% for 4K UHD video compared to H.264/MPEG-4 AVC. But HEVC/H.265 is not always perfect. Actually there are still some people wanna convert HEVC to MP4. This can be divided into two cases: for example, you get a Handbrake H.265 video in MKV, then you need to transcode it to MP4 for playback on your TV via USB, Xbox One, Amazon Fire TV, Roku 4, iMac 5K, Windows 10 laptop, 4K/UHD TVs etc. Or else you download a H.265 movie online, but it cannot be played on your devices like iPhone, Android unless you compress and convert H.265 to H.264, 4K, 1080P/720P, 480P etc. However, neither can be done without an effective x265 HEVC video converter. 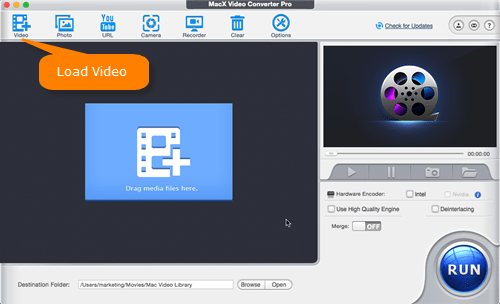 MacX Video Converter Pro is an optimal HEVC converter, which not only allows you to convert H265 MKV to MP4 H265, HEVC MKV to MP4 H264, but any common video formats, such as HEVC to AVI, WMV, MOV, MPEG-4 etc., or MKV to AVI, AVI to MP4, MTS to iMovie, YouTube to MP3 etc. With an intuitive interface (GUI), users can easily get the clues about how to convert HEVC x265 to MP4 even without any guide, irrespective of experts or green hands. Furthermore, this best video converter for Mac keeps you far away from the snail's pace for decoding X265 to MP4 like other competitors, thanks to the built in multi-core CPU utility, hyper-threading and advanced Intel QSV hardware acceleration tech, 30 seconds for 40-min 1080p HEVC conversion (related to your PC's hardware configuration). Meanwhile, the output MP4 video quality is quite impressive, up to the same as that of original video. How to Encode HEVC/H.265 to MP4 Easily and Fast? Before you start, there are something to be prepared for: a Mac/Windows computer (Intel QSV supported best); a H.265 encoded video and MacX Video Converter Pro. Then the first thing goes to free download the HEVC converter on Mac or Windows version to get ready for HEVC to MP4 conversion. 1. Click "+Video" button on the top left panel. 2. Directly drag and drop your H.265 files to the program window. 3. Locate to your H.265 video and right-click to open your H.265/HEVC file with the H.265 converter. After your H.265 video loaded, an output profile window will pop up instantly. 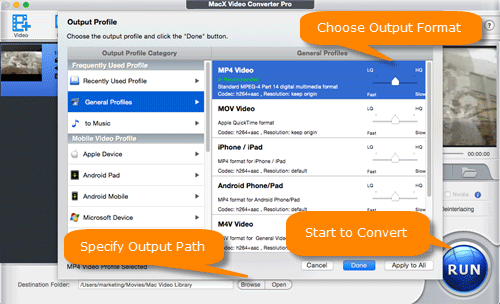 You can go "General Profiles" > "MP4 (H264)" or "MP4 (HEVC)" as output format. Click "Browse" button to specify the output folder path. Press "RUN" button to start to convert x265 to MP4 from MKV container format, so as to limitlessly play H.265 videos on Mac/Windows, iPhone iPad Android etc. BTW, the H.265 decoding process will be accomplished in no time thanks to the Intel QSV hardware acceleration (find it on the lower right corner of the main interface). Besides decoding and converting H.265 to H.264 codec MP4, MacX Video Converter Pro is also featured as a H.265 encoder, enabling you to convert videos to HEVC with the same steps above except for choosing output format. Still, you can also do some editing on this program, such as adjust H.265 video frame rate, bit rate, resolution and other parameters for further customizing. HEVC, short form for High Efficiency Video Coding, is a video compression standard successor to H.264/MPEG-4 AVC. So HEVC also known as H.265. HEVC is targeted at next-generation HDTV displays and content capture systems which feature progressive scanned frame rates and display resolutions from QVGA (320×240) to 4K UHD 4320p (8192×4320), as well as improved picture quality in terms of noise level, color spaces, and dynamic range. HEVC was designed to substantially improve coding efficiency compared to H.264/MPEG-4 AVC HP, that is to say, to reduce bitrate requirements by half with comparable image quality, at the expense of increased computational complexity. Many users are confused on the video codec, for example, MPEG-2 vs MPEG-4, H.264 vs H.265. Here we'd like to talk about the development of codec from MPEG-2, MPEG-4, H.264 and H.265. We hope it will helps when you convert a video for various devices. MPEG-2, adopted by most of broadcast television since 1999, and it is still the most widely used codec today for broadcast. Additionally, DVD incorporated this technology, and was able to include surround sound as a result. MPEG-4, associated with Internet in 2004, has about 30 parts, one for each technology. The two parts we are most concerned with are Parts 10 and 14. This suite incorporates a whole lot of technology from the beginning of this century till 2012 or so. H.264, or technically MPEG-4 Part 10, describes the AVC (Advanced Video Coding) format. It is the most widely used codec on earth, even surpassing broadcast MPEG-2, simply due to the power of the internet. It is used by Blu-ray, YouTube and every other video provider of note. H.265, the new kid on the block is MPEG-H in 2013. Part 2 is also called H.265 or HEVC. Here are its key benefits: Up to 8K UHDTV (8192×4320 maximum); 12-bit color bit depth; 4:4:4 and 4:2:2 chroma sub-sampling; Supports up to 300 fps (earlier versions only supported up to 59.94 fps); Data rates of several GB/s; File size 'subjectively' half the size of H.264 with better quality! Free download this top H265/HEVC video converter to easily transcode H265 (HEVC) MKV to MP4 in H.264/MPEG-4/AVC on Windows and macOS. Also support you to convert any video to MP4, MKV, MOV, AVI, FLV, WMV, MPEG, VP8, VP9, etc. 180+ video, 14+ audio formats. Not Found "Best" H265 to H264 Converter? Here it is!